The Hustler is a 1961 American drama film directed by Robert Rossen from Walter Tevis's 1959 novel of the same name, adapted for the screen by Rossen and Sidney Carroll. It tells the story of small-time pool hustler "Fast Eddie" Felson and his desire to break into the "major league" of professional hustling and high-stakes wagering by high-rollers that follows it. He throws his raw talent and ambition up against the best player in the country; seeking to best the legendary pool player "Minnesota Fats." After initially losing to Fats and getting involved with unscrupulous manager Bert Gordon, Eddie returns to try again, but only after paying a terrible personal price. The film was shot on location in New York City. It stars Paul Newman as "Fast" Eddie Felson, Jackie Gleason as Minnesota Fats, Piper Laurie as Sarah, and George C. Scott as Bert. The Hustler was a major critical and popular success, gaining a reputation as a modern classic. Its exploration of winning, losing, and character garnered a number of major awards; it is also credited with helping to spark a resurgence in the popularity of pool. Real-life pool player Rudolf Wanderone, known at the time as "New York Fats" and "Chicago Fats", claimed to be the real life inspiration for Gleason's character, Minnesota Fats, and adopted the name as his own. Small-time pool hustler "Fast Eddie" Felson travels cross-country with his partner Charlie to challenge the legendary player "Minnesota Fats". Arriving at Fats' home pool hall, Eddie declares he will win $10,000 that night. Fats arrives and he and Eddie agree to play straight pool for $200 a game. After initially falling behind, Eddie surges back to being $1,000 ahead and suggests raising the bet to $1,000 a game; Fats agrees. He sends out a runner, Preacher, to Johnny's Bar, ostensibly for whiskey, but really to get professional gambler Bert Gordon to the hall. Eddie gets ahead $11,000 and Charlie tries to convince him to quit, but Eddie insists the game will end only when Fats says it is over. Fats agrees to continue after Bert labels Eddie a "loser." After 25 hours and an entire bottle of bourbon, Eddie is ahead over $18,000, but loses it all along with all but $200 of his original stake. At their hotel later, Eddie leaves half of the remaining stake with a sleeping Charlie and leaves. Eddie stashes his belongings at the local bus terminal, where he meets Sarah Packard, an alcoholic who is supported by her father, attends college part-time, and walks with a limp. He meets her again at a bar. They go back to her place but she refuses to let him in, saying he is "too hungry". Eddie moves into a rooming house and starts hustling for small stakes. He finds Sarah again and this time she takes him in, but with reservations. Charlie finds Eddie at Sarah's and tries to persuade him to go back out on the road. Eddie refuses and Charlie realizes he plans to challenge Fats again. Eddie realizes that Charlie held out his percentage and becomes enraged, believing that with that money he could have rebounded to beat Fats. Eddie dismisses Charlie as a scared old man and tells him to "go lie down and die" by himself. At Johnny's Bar, Eddie joins a poker game where Bert is playing, and loses $20. Afterward, Bert tells Eddie that he has talent as a pool player but no character. He figures that Eddie will need at least $3,000 to challenge Fats again. Bert calls him a "born loser" but nevertheless offers to stake him in return for 75% of his winnings; Eddie refuses. Eddie humiliates a local pool shark, exposing himself as a hustler, and the other players punish him by breaking his thumbs. As he heals, Sarah cares for him and tells him she loves him, but he cannot say the words in return. When Eddie is ready to play, he agrees to Bert's terms, deciding that a "25% slice of something big is better than a 100% slice of nothing". Bert, Eddie, and Sarah travel to the Kentucky Derby, where Bert arranges a match for Eddie against a wealthy local socialite named Findley. The game turns out to be carom billiards, not pool. When Eddie loses badly, Bert refuses to keep staking him. Sarah pleads with Eddie to leave with her, saying that the world he is living in and its inhabitants are "perverted, twisted, and crippled"; he refuses. Seeing Eddie's anger, Bert agrees to let the match continue at $1,000 a game. Eddie comes back to win $12,000. He collects his $3,000 share and decides to walk back to the hotel. Bert arrives first and subjects Sarah to a humiliating sexual encounter. After, she scrawls "PERVERTED", "TWISTED", and "CRIPPLED" in lipstick on the bathroom mirror. Eddie arrives back at the hotel to learn that she has killed herself. Eddie returns to challenge Fats again, putting up his entire $3,000 stake on a single game. He wins game after game, beating Fats so badly that Fats is forced to quit. Bert demands a share of Eddie's winnings and threatens that Eddie will be injured unless he pays. But Eddie says that if he is not killed he will kill Bert when he recovers; invoking the memory of Sarah, he shames Bert into giving up his claim. Instead, Bert orders Eddie never to walk into a big-time pool hall again. Eddie and Fats compliment each other as players, and Eddie walks out. Pool champion Willie Mosconi has a cameo appearance as Willie, who holds the stakes for Eddie and Fats's games. Mosconi's hands also appear in many of the closeup shots. The Tevis novel had been optioned several times, including by Frank Sinatra, but attempts to adapt it for the screen were unsuccessful. Director Rossen's daughter Carol Rossen speculates that previous adaptations focused too much on the pool aspects of the story and not enough on the human interaction. Rossen, who had hustled pool himself as a youth and who had made an abortive attempt to write a pool-themed play called Corner Pocket, optioned the book and teamed with Sidney Carroll to produce the script. According to Bobby Darin's agent, Martin Baum, Paul Newman's agent turned down the part of Fast Eddie. Newman was originally unavailable to play Fast Eddie regardless, being committed to star opposite Elizabeth Taylor in the film Two for the Seesaw. Rossen offered Darin the part after seeing him on The Mike Wallace Interview. When Taylor was forced to drop out of Seesaw because of shooting overruns on Cleopatra, Newman was freed up to take the role, which he accepted after reading just half of the script. No one associated with the production officially notified Darin or his representatives that he had been replaced; they found out from a member of the public at a charity horse race. Rossen filmed The Hustler over six weeks, entirely in New York City. Much of the action was filmed at two now-defunct pool halls, McGirr's and Ames Billiard Academy. Other shooting locations included a townhouse on East 82nd Street, which served as the Louisville home of Murray Hamilton's character Findley, and the Manhattan Greyhound bus terminal. The film crew built a dining area that was so realistic that confused passengers sat there and waited to place their orders. Willie Mosconi served as technical advisor on the film and shot a number of the trick shots in place of the actors. All of Gleason's shots were his own; they were filmed in wide-angle to emphasize having the actor and the shot in the same frames. Rossen, in pursuit of the style he termed "neo-neo-realistic", hired actual street thugs, enrolled them in the Screen Actors Guild and used them as extras. Scenes that were included in the shooting script but did not make it into the final film include a scene at Ames pool hall establishing that Eddie is on his way to town (originally slated to be the first scene of the film) and a longer scene of Preacher talking to Bert at Johnny's Bar which establishes Preacher is a junkie. Early shooting put more focus on the pool playing, but during filming Rossen made the decision to place more emphasis on the love story between Newman and Laurie's characters. Despite the change in emphasis, Rossen still used the various pool games to show the strengthening of Eddie's character and the evolution of his relationship to Bert and Sarah, through the positioning of the characters in the frame. For example, when Eddie is playing Findley, Eddie is positioned below Bert in a two shot but above Findley while still below Bert in a three shot. When Sarah enters the room, she is below Eddie in two shot while in a three shot Eddie is still below Bert. When Eddie is kneeling over Sarah's body, Bert again appears above him but Eddie attacks Bert, ending up on top of him. Eddie finally appears above Bert in two shot when Eddie returns to beat Fats. The Hustler is fundamentally a story of what it means to be a human being, couched within the context of winning and losing. Describing the film, Robert Rossen said: "My protagonist, Fast Eddie, wants to become a great pool player, but the film is really about the obstacles he encounters in attempting to fulfill himself as a human being. He attains self-awareness only after a terrible personal tragedy which he has caused — and then he wins his pool game." Roger Ebert concurs with this assessment, citing The Hustler as "one of the few American movies in which the hero wins by surrendering, by accepting reality instead of his dreams." The film was also somewhat autobiographical for Rossen, relating to his dealings with the House Un-American Activities Committee. A screenwriter during the 1930s and '40s, he had been involved with the Communist Party in the 1930s and refused to name names at his first HUAC appearance. Ultimately he changed his mind and identified friends and colleagues as party members. Similarly, Felson sells his soul and betrays the one person who really knows and loves him in a Faustian pact to gain character. Film and theatre historian Ethan Mordden has identified The Hustler as one of a handful of films from the early 1960s that re-defined the relationship of films to their audiences. This new relationship, he writes, is "one of challenge rather than flattery, of doubt rather than certainty." No film of the 1950s, Mordden asserts, "took such a brutal, clear look at the ego-affirmation of the one-on-one contest, at the inhumanity of the winner or the castrated vulnerability of the loser." Although some have suggested the resemblance of this film to classic film noir, Mordden rejects the comparison based on Rossen's ultra-realistic style, also noting that the film lacks noir's "Treacherous Woman or its relish in discovering crime among the bourgeoisie, hungry bank clerks and lusty wives." Mordden does note that while Fast Eddie "has a slight fifties ring", the character "makes a decisive break with the extraordinarily feeling tough guys of the 'rebel' era ... [b]ut he does end up seeking out his emotions" and telling Bert that he is a loser because he's dead inside. The Hustler had its world premiere in Washington, D.C. on September 25, 1961. Prior to the premiere, Richard Burton hosted a midnight screening of the film for the casts of the season's Broadway shows, which generated a great deal of positive word of mouth. Initially reluctant to publicize the film, 20th Century Fox responded by stepping up its promotional activities. The film was well received by critics, although with the occasional caveat. Variety praised the performances of the entire main cast but felt that the "sordid aspects" of the story prevented the film from achieving the "goal of being pure entertainment." Variety also felt the film was far too long. Stanley Kauffmann, writing for The New Republic, concurred in part with this assessment. Kauffmann strongly praised the principal cast, calling Newman "first-rate" and writing that Scott's was "his most credible performance to date." Laurie, he writes, gives her part "movingly anguished touches" (although he also mildly criticizes her for over-reliance on Method acting). While he found that the script "strains hard to give an air of menace and criminality to the pool hall" and also declares it "full of pseudo-meaning", Kauffmann lauds Rossen's "sure, economical" direction, especially in regard to Gleason who, he says, does not so much act as "[pose] for a number of pictures which are well arranged by Rossen. It is the best use of a manikin by a director since Kazan photographed Burl Ives as Big Daddy." The New York Times, despite finding that the film "strays a bit" and that the romance between Newman and Laurie's characters "seems a mite far-fetched", nonetheless found that The Hustler "speaks powerfully in a universal language that spellbinds and reveals bitter truths." The Hustler received nine Academy Award nominations. The film won two, for Best Art Direction-Set Decoration, Black-and-White (Harry Horner and Gene Callahan) and Best Cinematography, Black-and-White (Eugen Schüfftan). The film was also nominated for Best Picture and Newman was nominated for Best Actor in a Leading Role. Gleason and Scott were both nominated for Best Actor in a Supporting Role; Scott refused the nomination. Laurie was nominated for Best Actress in a Leading Role. Rossen received nominations for Best Director and, with Carroll, for Best Writing, Screenplay Based on Material from Another Medium. Newman was nominated for a Golden Globe Award for Best Actor. Gleason and Scott were each nominated for Best Supporting Actor and Scott was also nominated as Best New Star of the Year. At the 1962 BAFTA Awards, The Hustler tied with the Soviet film Ballad of a Soldier for Best Film from Any Source. Newman won for Best Foreign Actor and Piper Laurie was nominated for Best Foreign Actress. Gleason was honored as Best Supporting Actor by the National Board of Review of Motion Pictures and the film was named among the Board's ten best films of 1961. Rossen was named Best Director by the New York Film Critics Circle Awards and Rossen and Carroll shared the Writers Guild of America Award for Best Written Drama. In the decades since its release, The Hustler has cemented its reputation as a classic. Roger Ebert, echoing earlier praise for the performances, direction, and cinematography and adding laurels for editor Dede Allen, cites the film as "one of those films where scenes have such psychic weight that they grow in our memories." He further cites Fast Eddie Felson as one of "only a handful of movie characters so real that the audience refers to them as touchstones." TV Guide calls the film a "dark stunner" offering "a grim world whose only bright spot is the top of the pool table, yet [with] characters [who] maintain a shabby nobility and grace." The four leads are again lavishly praised for their performances and the film is summed up as "not to be missed." Paul Newman reprised his role as Fast Eddie Felson in the 1986 film The Color of Money, for which he won the Academy Award for Best Actor in a Leading Role. A number of observers and critics have suggested that this Oscar was in belated recognition for his performance in The Hustler. In 1997, the Library of Congress selected The Hustler for preservation in the United States National Film Registry as "culturally, historically, or aesthetically significant." The Academy Film Archive preserved The Hustler in 2003. Carroll and Rossen's screenplay was selected by the Writers Guild of America in 2006 as the 96th best motion picture screenplay of all time. In June 2008, AFI released its "Ten top Ten"—the best ten films in ten "classic" American film genres—after polling over 1,500 people from the creative community. The Hustler was acknowledged as the sixth best film in the sports genre. The Hustler is credited with sparking a resurgence in the popularity of pool in the United States, which had been on the decline for decades. The film also brought recognition to Willie Mosconi, who, despite having won multiple world championships, was virtually unknown to the general public. Perhaps the greatest beneficiary of the film's popularity was a real-life pool hustler named Rudolf Wanderone. Mosconi claimed in an interview at the time of the film's release that the character of Minnesota Fats was based on Wanderone, who at the time was known as "New York Fatty". Wanderone immediately adopted the Minnesota Fats nickname and parlayed his association with the film into book and television deals and other ventures. Author Walter Tevis denied for the rest of his life that Wanderone had played any role in the creation of the character. Other players would claim, with greater or lesser degrees of credibility, to have served as models for Fast Eddie, including Ronnie Allen, Ed Taylor, Ed Parker, and Eddie Pelkey. ↑ The Hustler, Box Office Info. The Numbers. Retrieved April 14, 2012. ↑ "'The Hustler,' at Martini, Filmed On Location In N.Y.". The Galveston News. 1961-10-05. 1 2 3 4 5 6 Ebert, Roger (2002-06-23). 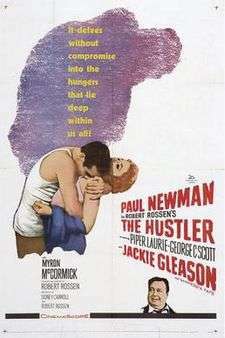 "The Hustler (1961)". Chicago Sun-Times. Retrieved 2008-03-31. ↑ Kilgallen, Dorothy (1961-05-29). "Voice of Broadway". New Castle (PA) News. ↑ "Dream Street". Uniontown (PA) Morning Herald. 1961-09-08. ↑ Kilgallen, Dorothy (1961-04-21). "Edith Piaf Worries Friends". Lowell Sun. ↑ Naylor, David (director) (2001). The Hustler: The Inside Story (film). ↑ Variety staff (1961-01-01). "The Hustler". Variety. variety.com. Retrieved 2008-04-24. ↑ Kauffmann, Stanley (1961-10-09). "The Talent of Paul Newman". The New Republic. p. 28. ↑ Weiler, A H (1961-10-08). "Provocative Duo: 'The Hustler' and 'The Mark' Again Show Films Can Hit Social Ills". The New York Times. ↑ "The Hustler — Awards". allmovieguide.com. Retrieved 2008-03-31. ↑ "Awards Search: The Hustler". Hollywood Foreign Press Association. Retrieved 2008-03-31. ↑ "Film Nominations - 1961". British Academy of Film and Television Awards. Archived from the original on 2008-02-28. Retrieved 2008-03-31. ↑ "Awards - 1961". National Board of Review of Motion Pictures. Retrieved 2008-03-31. ↑ "New York Film Critics Circle: 1961 Awards". New York Film Critics Circle. Archived from the original on 2008-01-12. Retrieved 2008-03-31. ↑ "WGA Awards". Writers Guild of America. Retrieved 2008-03-31. 1 2 3 "The Hustler". TVGuide.com. Retrieved 2010-04-17. ↑ Berardinelli, James (2002). "Review: Hustler". Reelviews.net. Retrieved 2008-04-24. 25 years late, Newman won the Best Actor Oscar for playing Fast Eddie. ↑ "New to the National Film Registry". The Library of Congress Information Bulletin. Library of Congress. December 1997. Retrieved 2008-03-20. ↑ "101 Greatest Screenplays". Writers Guild of America West. Retrieved 2008-03-20. ↑ American Film Institute (2008-06-17). "AFI Crowns Top 10 Films in 10 Classic Genres". ComingSoon.net. Retrieved 2008-06-18. ↑ "Top 10 Sports". American Film Institute. Retrieved 2008-06-18. Casty, Alan (1969). The Films of Robert Rossen. New York, The Museum of Modern Art. LCCN 68-54921. Dyer, R. A. (2003). Hustler Days: Minnesota Fats, Wimpy Lassiter, Jersey Red, and America's Great Age of Pool. New York, Muf Books. ISBN 1-56731-807-X. Rossen, Robert (1972). Three Screenplays: All the Kings Men, The Hustler, and Lilith. New York, Anchor Doubleday Books. LCCN 70-175418. Solomon, Aubrey (1989). Twentieth Century Fox: A Corporate and Financial History (The Scarecrow Filmmakers Series). Lanham, Maryland, Scarecrow Press. ISBN 978-0-8108-4244-1. Starr, Michael and Michael Seth Starr (2004). Bobby Darin: A Life. Taylor Trade Publications. ISBN 1-58979-121-5. Wikimedia Commons has media related to The Hustler (film).